On Sunday, 18th July 2010 I got a report that there was a fire disaster that had happened at Alexandra’s Helen Josephs Hostel in the early hours of the day. I then went there to find out what had happened. The hostel is situated within ward 75 of the Johannesburg Metropolitan Council under Councillor Ambi Maseko, who also stays at the hostel. We were unable to meet with her as we were told that she was at a meeting elsewhere. When I arrived there I found out that 29 shacks had been destroyed by fire. I interviewed some of the people affected and neighbours, and they indicated that the fire must have started between 12h30 and 12h50. One female resident said that they had people screaming that there was fire and they went out to assist in putting out the fires but it was very strong. She said that the fire fighters and paramedics arrived very late. One person, known as Smally, died in one of the shacks. It is not clear how or where the fire started, but it spread to other shacks quickly, as they are very close to each other and overcrowded. The Johannesburg’s Disaster Management team had come and they donated blanket and food hampers to 28 families of the affected people. 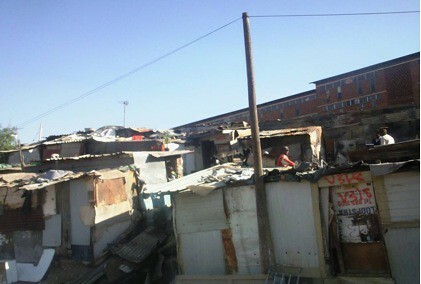 I observed that the shacks are cramped and they are built such that they seem to be built on top of each other. This shows that there is lack of land where these people can expand to. This fire disaster comes very close to an earlier one at 2nd Avenue, Alexandra where 61 shacks burnt down and 1 person died. While there are problems of overcrowding and lack of land in Alexandra, there are also positives like the building and management of public toilets. For an area like Alexandra, where there is so much overcrowding, the building of public toilets that are maintained and cleaned by the community itself is a very positive development. Community members are charged R1 each for using the facilities which is used for payment of honorarium for volunteer cleaners and those who monitor them.